Jam, Jam, Jam, Yum, Yum, Yum… | Wha’ever! This year’s first jam batches are waiting for being eaten! I just need to get more glasses first, my carefully collected stock is kind of exhausted right now. I was even forced to freeze some kilos of berries! Until now, I dealt with about 11 kilos of fruit, I just counted. Incredible. One does not notice how much it becomes once one is on it! Dear Swedish readers, would anyone of you know any good and not too expensive supplier for jam-glasses? The boyfriend is getting tired of having so much Sill (Swedish pickled herring) during the year, just because I want the glasses, ya’ know… . ;). P.S. : In case you wonder about the alcohol content – it is safe to drive after breakfast. The good stuff serves to get a nice finish on some exquisite fruits, which are mostly from the home garden. 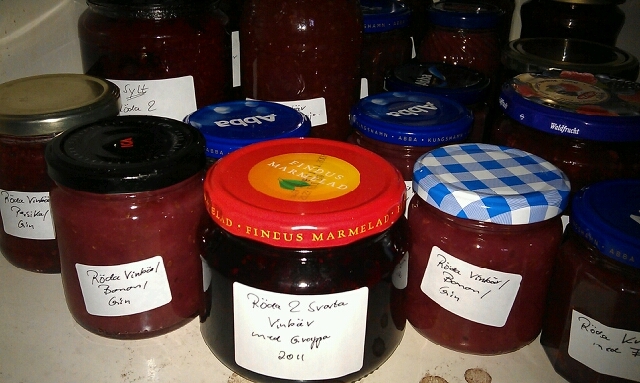 I decided to specialise in jam and marmalade that contains alcohol. Simply as I don’t see it that often, especially not in Sweden. It is amazing and much fun to experiment with what kind of extra flavour spirits add to different combinations. The secret is about smelling what fits with each other and combining it in the right amounts. To find that perfect balance in taste is my challenge. And it is a personal pleasure to see that the people tasting the outcome prove me right most of the time in my decision of combining the different ingredients. Hope that was not too much of self-praise now? You might want to try to stand guard at the glasinsamlingen and persuade people to give you their burkar instead of throwing them away?